In this guide find out the best methods of how to cure cold spots and cold walls in your house, including solutions for cold spots on interior and external walls. Cold spots can cause damp and mould to appear on your walls, which left unattended can result in damage to plaster and internal decoration. Their causes can be various but fortunately most are reasonably easy to cure, so if you have cold spots in your house then read on and find out how to get them sorted. Cold spots on internal walls and damp spots on walls can be caused by a variety of different things, and in this project we’ll discuss the cures for the full range of causes of cold spots and damp spots on your interior and external walls. The act of warm air within the room touching a cold interior wall will in most cases create condensation and damp spots which in turn can create other issues of their own, so it’s important to treat your cold spots as soon as you notice them. In the majority of cases there are only a few reasons why cold spots and damp spots appear on walls. These are listed below along with details on the effects that cold and damp walls can have on your living space. If after reading this guide you would still like some additional expert advice give Property Repair Systems a call on 01626 336108. 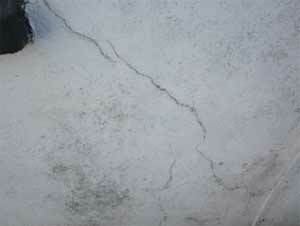 The most common effects of cold and damp on interior walls are clusters of condensation (in early stages), black mould, damaged plaster (in extreme cases the plaster starts to blow off the wall) and occasionally a build-up of a white salt like substance (Hygroscopic Salts produce a white staining, and ‘salts’ can instead present as a raised, crunchy salt deposit which can blow your plaster). In the case of a Hygroscopic Salt issue (hygroscopic meaning water attracting), these can sometimes be more pronounced around a chimney breast. Burning fuels produces mineral and tar by-products, among them hygroscopic salts, and these can over time seep through walls and on to the internal surface of the walls. This means that hygroscopic salt issues are generally more likely on chimney breasts, and that this may well be the cause of your damp wall issue if you have a chimney in your room. Because hygroscopic salts are moisture attracting, this means that any salt deposits will create damp patches that come and go – this is another good indicator for hygroscopic salts being your issue or at least part of your issue. Issue – As you may know, wall ties are inserted between courses of brick and effectively tie the two walls in a cavity wall together, which allows them to support each other. At the time of construction, mortar used to build the walls can fall and land on wall ties within the cavity. Over time this mortar can collect other rubbish, dust particles and moisture and then provide this moisture a direct route on to the internal cavity wall – a Cold Bridge. This creates a difference in temperature around the affected area compared with the rest of the wall (a cold spot on the wall) which can cause condensation which can then turn the cold spot into a damp spot too. Wall ties can also rust due to prolonged exposure to moisture and water. When this happens, the rusting process can cause the tie to expand, causing the mortar that the tie is sitting in to break up, which creates a gap in the external wall. This in turn allows cold air and moisture to penetrate the external wall and access the inner cavity wall, again causing a cold spot on the interior wall which can attract condensation and become damp. Fix – The only way to properly inspect the issue and fix it is to locate the suspect wall tie (the best method for this is to hire a metal detector so that you can accurately pin point it, probably around the area where the damp patches are). Once you have located the wall tie inspect the area around it for damage to mortar etc… Now remove one or two bricks from the outside wall (information on this can be found in our Replacing a Damaged Brick Project) (NOTE: do not remove more than two – if you need to please consult with a reliable builder or surveyor) so that you can clearly and easily spot any issues. If the tie is dirty then clean it off thoroughly, removing any debris or mortar that may be present. If you find that your wall tie is rusty and has started to crack the supporting mortar then it will need replacing with a new one to prevent further cold and damp issues and restore the support to the wall. For instruction on how to do this see our Replacing Wall Ties project . In the event that you have rusting wall ties this could be a sign that water is getting in at another location, so you will also need to thoroughly check and locate the source of any leaks and get them repaired. If left unattended this could cause huge issues later down the line. You can find more information on detecting a leak in our Tracing a Leak project. Issue – For anyone that has looked at getting their cavity walls insulated you will probably know from just a brief search online that this can be a bit hit and miss in terms of success. There are quite a few companies out there that (being diplomatic) may not necessarily have the correct skill set, knowledge (what insulation to use, as there are several different types, and in what situations they should be used, size of holes that should be drilled and in what locations etc…) or tools to do it properly. If you are looking to get this done, make sure that you do your research first. The effects of a poor job can be extensive. If the cavity is not filled to the correct height etc… and gaps are left in the fill then this can cause temperature variations and cold spots in your walls, which as we have outlined previously can cause condensation, mould growth, hygroscopic salts, damp spots and other issues. Done properly, cavity wall insulation can give huge benefits, mostly in the form of a warmer home and lower energy bills. You can find out more about cavity wall insulation on our Cavity Wall Insulation page. Fix – As with the wall ties issue above, the only real way to check that this is causing your cold spots is to remove a couple of bricks from the outside wall directly opposite your cold spot or damp spot on the interior wall. If you are unlucky enough to find that gaps and air spaces are present in your insulation then there is not really a lot that can be done other than getting installers in to do a re-injection (this may require the removal of the original insulation). Your best bet is to consult with a reputable cavity insulation company and see what they suggest, again be sure to to do your research to find a reliable company. Issue – The cause of this is really in the name. This issue occurs when damp and moisture penetrates a surface and affects those surfaces behind it. In most situations this is the result of failure in the pointing between the bricks or blocks of the outside wall, spalling (cracked and crumbling brick faces) or cracking in any facing render. In other words, a compromise in the integrity of the protective outside wall. Moisture and water that can then penetrate the wall can in some instances also bring in salts from the brickwork that go on to cause their own problems. ‘Salts’, as they are known, get drawn out from a damp wall as the moisture evaporates from the surface of the wall. These salts are then left on the surface as raised, crunchy deposits on and in your plaster that can split your plaster. Damp spots on your wall are usually also cold spots by their nature because damp walls lose heat three times faster than dry walls. Again, this attracts moisture which condenses on the damp spot to make the situation worse. 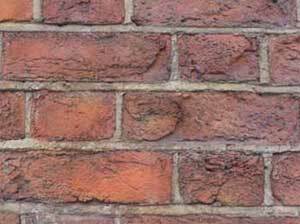 Fix – If you find that you have damaged pointing mortar then it will need replacing (see our Pointing and Repointing Mortar project for more information). Any damaged or spalling bricks will also need replacing. This is a fairly straightforward job and more information can be found in our Replacing a Damaged Brick project on the link above. When it comes to damaged render this will also need to be fixed. 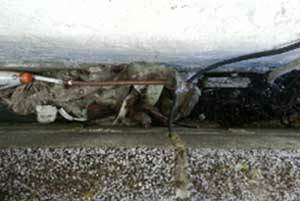 The reasons for render failing vary, but the most common reasons are that there may be not enough of a “key” for it to grip on to on the surface beneath (scratch coat), the scratch coat is of a different consistency to the top coat, the wall’s surface was not prepared correctly, it may have been laid in poor weather conditions (too hot or too cold) or cracks and splits could be the result of movement of the property over the years. In some cases render cracks can be repaired using suitable filler and the join sealed afterwards, but this repair will always be visible in most instances, even if you paint it. If you are not too concerned about this, then this could be an option. 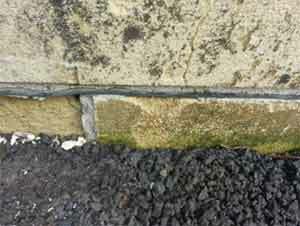 If you have numerous cracks running all over the face of your render then the best option is to hack it all off and re-render ensuring that the surface wall is correctly prepared (clean all mortar joints, face of the wall (power wash if possible), remove any paint, and paint the wall with SBR bonding slurry. Rendering can be a tricky job so to ensure a good finish either practice first until you are suitably proficient or seek the services of a decent and reliable plasterer/renderer. You may be thinking that a complete re-render is expensive and you would be right! A very, very rough ball-part figure would be somewhere around the region of £2500 – £3500 but to ensure you are rid of any cold spot and damp spot issues and have a great finish sometimes you just have to bite the bullet. Issue – Another cause of damp spots and cold spots in your room can be the presence of pipes, wires or fixings within the wall itself. On occasion during the construction of the property the builder/heating engineer may choose to run some pipe work (normally central heating related) within the cavity. Likewise, an electrician may choose to run some wiring (possibly lighting related) from a light switch, up the cavity and over the ceiling to a lighting fixture. This is not necessarily the best way to do things but it does happen. Similarly there can be a massive amount of fixings, bolts and screws that are attached to the internal walls of a property, i.e. the walls of your rooms inside the house. It’s not uncommon for these to go through the internal cavity wall and protrude into the cavity void. When this happens, any moisture or water that is present in the void, whether from leaks in your roof or cracks in your mortar, can have a direct path to the surface of the inside wall by settling on and running along the fixing, causing damp spots and cold spots on your interior wall. This issue can be a good indication that you are suffering from a leak somewhere, so at this point it would be a very good idea to carry out a thorough investigation and locate the source of any leaks and fix them. Any gaps around your fixings will also allow water and cold air into your void, which will contribute to any damp or cold spot issues you are having. Fix – If it’s not obvious which fixing is causing the problem, it’s a good idea to remove a brick from the outside wall directly opposite the issue to see if you can locate the fixing causing the damp problem if a fixing is to blame. 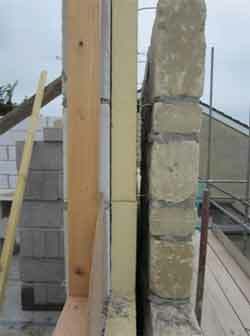 The first course of action is to remove the protruding object from the wall and correctly fill the hole using a suitable solid filler (if removal is possible). If it is not possible to remove the object e.g. 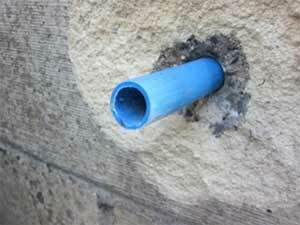 it’s a heating pipe, then you will have to fill the gap around it fully. In this instance use flexible filler as the pipe work will likely expand and contract. Issue – This is typically caused by a water or moisture leak. The leak itself can draw the salts present in bricks, blocks etc…. through the inner cavity wall where they then create a visual impact on the walls of a room space. This can be more apparent around chimney breasts (chimney salts) where the action of burning fuels releases minerals, among them hygroscopic salts, that can condense on the inside of a chimney breast. Typically they will leave a yellowy brown residue due to the tars that are released from materials such as wood during the burning process. These salts are hygroscopic in nature (moisture attracting) and not only manifest themselves as a white salty substance staining the surface of your chimney breast but also attract moisture from the ambient air within a room, creating damp spots and cold spots and even whole cold interior walls. These damp patches usually come and go with the changing humidity of your room, so if this is happening, it’s likely that hygroscopic salts are the cause of your damp issues. There is another type of salt deposit known as ‘salts’ that appears as a crunchy, raised white deposit. These salts are deposited on the wall when a damp issue is present in your wall – when the moisture evaporates from the surface of your wall, it leaves these salts behind. These salts are usually created as a result of a leak or severe damp issue, and they can blow your plaster right off the wall. 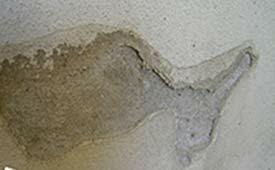 Fix – If your salts are hygroscopic, that is, if your damp patches come and go, and there are no other damp issues apart from that, take a look at the state of your plaster. If it’s sound, then you are okay to treat your wall with salt neutraliser. There are quite a few available on the market at present but the best salt neutraliser we’ve found is made by PRS – it produces consistently great results. This will stop the salts appearing – once it is dry, you can then redecorate. If your salts are hygroscopic but your plaster is blown, you will have to strip the plaster off and treat the underlying wall with salt neutraliser instead – you can get salt neutraliser that you paint directly onto the wall, a salt neutraliser that is already included in the plaster you are using to replaster, or a salt neutraliser that you can add to your plaster mix. If you have ‘salt’ deposits on your walls, or hygrocopic salts aren’t the only cause of your damp and cold walls, the first task to complete is to locate and repair any leaks and moisture points. Take a look further down this page for fixes for different moisture sources. Once this is done, you will then have to dry the area out, removing any damp spots on the walls and taking as much time as needed, in some cases several months. Heaters, ventilation, fans and dehumidifiers can help with this. Once completely dry assess the damage – there is a chance that if your damp spots are fairly minor then any plaster present or surface decoration will have survived once dry. 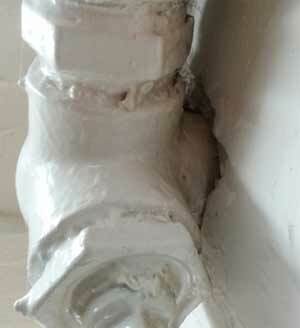 If this is the case then you can leave the old plaster on and just treat for salts before redecorating. You can do this by applying a salt neutraliser to the surface of the wall – as mentioned above we use the salt neutraliser made by PRS as it’s a reliable solution. Once the neutraliser coat on the wall is dry, you can then redecorate. If the damp has caused any staining on your walls, you can use a Stain and Damp primer on the area first to prevent the stains from showing through the newly decorated surface. Again, as with all things there are a great number of suitable products available on the market but we tend to use PRS Ultra Stain and Damp Primer Paint. In most cases any consistent water or moisture ingress and damp spots to a plastered surface will damage it beyond easy repair and cause it to blow off of the wall so it will all need to be hacked off, removing the damaged area and also any affected areas around it. With all the plaster removed, allow any further damp areas beneath to dry thoroughly and where hygroscopic salts are present, treat with a salt neutraliser. You can get a pre-mixed salt neutraliser and plaster mix or you can get salt neutraliser that you can add to the plaster mix (as mentioned above). In extreme salt conditions it may also be necessary to apply not only the salt neutraliser but also an air gap membrane to prevent further salts from penetrating the plastered surface. These air gap or mesh membranes are effectively insulated and pitted plastic sheets that form an insulating barrier between your wall and the decorated surface. There is a varied selection on the market such as those made by Twistfix and Dry Wall and Floor but we use the Mesh Membrane from Property Repair Systems. Now that you have dealt with your cold spot and damp spot causes, dried the area and removed any affected materials and prepped with a suitable product to prevent any further issues you can now replaster. As with all things DIY you can do it yourself (practice first) or get a plasterer in. At this point it may also be worth considering replastering with a lime based plaster due to its ability to breath. 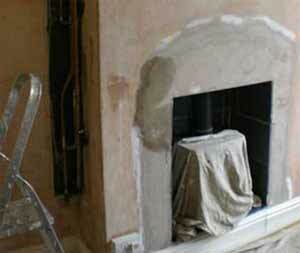 With the area plastered, cover it with a suitable damp and stain primer and then you can redecorate – job done! Issue – As mentioned in the title, the tell-tale signs of this issue tend to be cold spots and damp spots on your interior walls just above the skirting boards (normally damp to the touch or with a black mould build up) and a build up of lichens and moss on the external walls. Rising damp is, as the name suggests, damp that rises up from the water and moisture found in the ground. To prevent this from happening, a damp proof course (a waterproof layer) is fitted between courses of bricks about 6 inches up from ground level. The damp proof course itself can be constructed from a variety of different materials including slate, felt and plastic sheeting. Confirm that you actually have a DPC, as especially in older properties, some houses have been built with no DPC. If the DPC is not visible on the external wall dig down a few inches if possible to look for your DPC there. If you find it below ground level then you have an external bridging issue. If there are any structures attached to the external wall near the affected area, check these to see if they reach above the DPC. If they do, then there may be an external bridging issue. 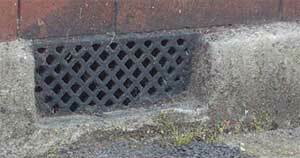 If the DPC is visible above ground level, remove a brick or two (no more than two) and inspect the cavity for debris. More information on how to remove a brick is available in the project mentioned above. Inspect the DPC for damage, wear and tear and compromising. Fix – The findings of your investigations will dictate what fix you implement. In the case that your Damp Proof Course is bridged externally, you will have to remove the obstructing object to expose the damp proof course once more. If this is not possible e.g. the obstructing object is a fairly recently constructed conservatory, then you will need to insert a new DPC above the level of the structure. You can do this by drilling holes into your internal and external walls and injecting a special chemical DPC liquid or cream – this is a chemical formulation that is absorbed into the brick. Once in the brick, the chemicals join together with one another across the brick to form a waterproof layer. 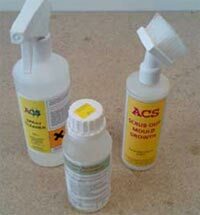 You can use one of the many DIY chemical DPC injection kits available on the market such as Permaguard, Twistfix etc…. 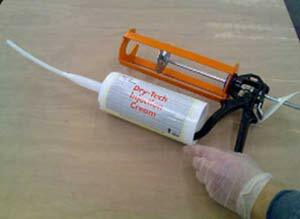 We tend to use the cream DPC formulation made by Property Repair Systems. This fix will also be the same if you don’t have a damp proof course or if you have a DPC but it’s damaged. If when you have removed bricks you find that your DPC has been bridged inside the cavity void by debris, you will need to clear all the debris out and ensure that no further rubbish enters the space. Use tough gloves to do this as some of the debris may be sharp. Once totally clear, replace any bricks that you have removed. Once you have solved the source of water or moisture ingress you can then go about repairing the damage done by the damp spots. Dry out the area thoroughly taking as much time as needed for this and then assess the results. In light damage cases the plaster may be able to be saved. You can then treat the surface with a salt neutraliser if there are any salt deposits present, and you can remove any mould present with an anti-mould cleaner. You can apply a damp and stain primer to prevent any staining caused by the damp showing through on the newly decorated surfaces. Once the treated wall is dry you can then redecorate as required. If the damage to the plaster is too extensive then the entire damaged area will need to be hacked off and replaced. Any damp underneath will need to be dried out and then the wall’s surface treated as needed with a salt neutraliser if salts are present. You can get salt neutralisers you paint directly onto the wall’s surface such as PRS’ salt neutraliser, or you can get neutralisers that you add or are already added to the plaster mix you’re using for replastering. If there are heavy salts present you will also need to cover the wall with a mesh membrane before you replaster. The membrane stops the salts from travelling into your plaster in the future. 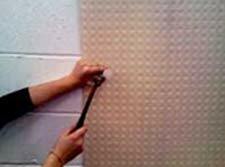 More information on attaching a mesh membrane to your wall can be found in our Mesh Membrane project page. 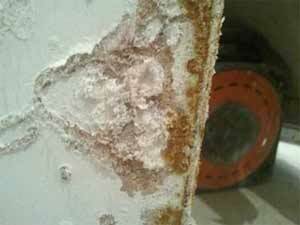 Issue – The normal causes of this are hygroscopic chimney salts. These salts, as mentioned above, mostly come from the materials that are burnt e.g. wood etc…. The mineral deposits that build up on the inside of a chimney breast can seep through the wall and appear on the external chimney breast surface and create damage in the form of white and brown staining and salt buildup. These salts attract moisture and cause damp spots to appear on the chimney breast, which usually come and go as the humidity in your room changes. The fact that the salt deposits are penetrating the wall could also indicate a leak, so you will also have to check any open chimney pots to ensure moisture is not getting in here and also cracked mortar, broken tiles, damaged flashing etc. More information on what to check to find what’s causing damp in your chimney area can be found in our Chimney Damp Project page. Another cause of cold and damp patches in your chimney area can be poor ventilation – a chimney breast should be vented top and bottom to produce a decent air flow and prevent cold air becoming trapped in the void. If cold air is trapped in the void then your chimney breast will most likely be at a different temperature to the rest of the room, which in most situations will cause a cold spot or a cold wall where moisture in the air will then condense and cause a damp patch. This issue can be more prevalent if you have capped chimney pots or blocked up fire openings that themselves have not had suitable ventilation installed. 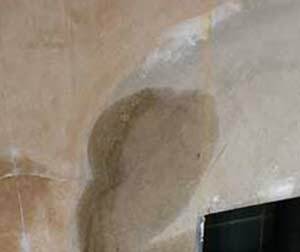 Fix – In the event that you have hygroscopic salts creating damp spots and staining on your walls or chimney breast, and your plaster is sound, then you can fix the salt issue by painting on a salt neutraliser as mentioned earlier. If there is any mould present you will need to clean this off with an anti-mould cleaner, and if there are any stains left by the damp and mould you can ensure these don’t show through the new decoration by painting on an anti-stain primer first. If the plaster is not sound, you will need to hack off any damaged plaster and then treat the underlying surface with a salt neutraliser and fit a mesh membrane to the wall before re-plastering if the salt deposits are heavy (products to do so are mentioned above). 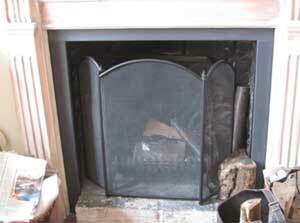 If you find that you do not have any ventilation in your chimney (either top or bottom or both) then you will need to add some, in the form of cowls for your chimney top and air bricks inserted into your wall in front of your fireplace if you have a blocked up fireplace. You should aim to insert your airbrick in the wall on the ground floor about 300mm up from the floor. If you have a suspended floor with a void underneath it may be best to position the vent under the floor as this will help to prevent draughts in room spaces (ensure the void beneath the floor itself is also ventilated via air bricks in the external walls). In terms of top ventilation, an air brick should be inserted towards the top of the chimney breast on the outside wall of the property to allow any cold air to ventilate outwards. 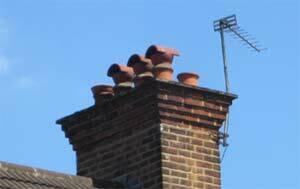 If your chimney pots are capped, you should replace the caps with cowls – these are ventilated caps that don’t allow rain to enter but still allow air to enter and leave. Cowls are available in a wide variety of styles and in different materials such as metal and clay. With the ventilation issues sorted you will have to dry the damaged area out properly – this may take some time. Now remove any wallpaper that may be covering the damaged area and assess the condition of the plaster. If the damage is not too bad then you can cover it with a damp and stain blocking paint (suitable product mentioned above) and then redecorate over the top. If the plaster is too far gone then any damage will need to be hacked off and replaced with new plaster. Again if salts are present, treat with a salt neutraliser and add a membrane if necessary. If you need any help finding the cause of the cold spots on your walls and curing them, please contact Property Repair Systems on 01626 336180 and they will be happy to help with any damp issues you may have. We have worked with them on a number of projects over the years and they are specialists in this subject.